Store front of Down to Earth Pearlridge in Pearlridge Center shopping mall. The Wellness Department has the largest selection of vitamins and supplements available plus cosmetics and natural living household items. Over 50 items to choose from! The deli has vegetarian versions of all-time classic favorites from American, Filipino, Asian, Mexican, Indian and Italian cooking as well as other international cuisines. The salad bar offers everyday favorites such as homemade coleslaw and potato salad and unusual items such as nutritious curry quinoa salad and rainbow kale salad, mock-chicken tofu salad, Okinawa sweet potato salad, tofu-nori wraps, and house-made dressings. Over 50 items to choose from on the deli hot table and salad bar. Bulk Foods save you money and reduce packaging that otherwise might go to the landfill. Relax in our indoor dining area. Enjoy a fresh breeze while you dine outdoors in front of our store. Our brand new first ever stand-alone store has finally opened on December 1st, 2018. This new Pearlridge location has relocated next to the old Toys'R'Us. 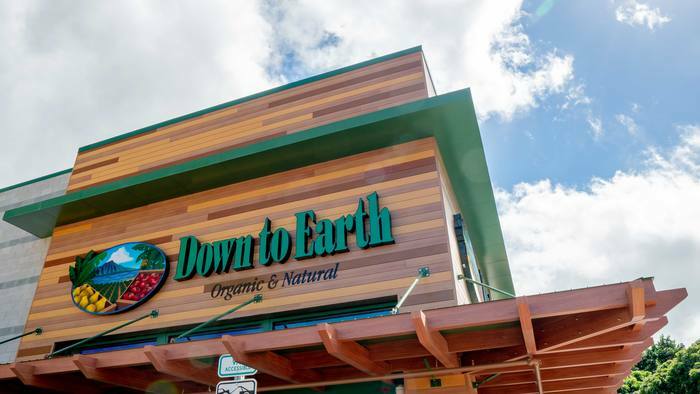 Customers seeking a Down to Earth store West of Honolulu will find this store to be the most convenient. It offers a variety of natural and organic foods and groceries including dairy products, local organic produce, bulk foods, vitamins and natural supplements, body care products, and household items. The Pearlridge store features a deli with hot food and cold salad bars, fresh juices and smoothies, a great made-to-order sandwich menu and grab-and-go options and a wide variety of eggless desserts. Free parking is provided in the parking lot beside the store.